President Barack Obama speaks at the Global Entrepreneur Summit at Stanford University in California, June 24, 2016, where he gave opening remarks on Britain voting to leave the 28-nation European Union. With world financial markets reeling from the shock that Britain voted to leave the European Union, U.S. President Barack Obama put out a measured statement Friday. "The people of the United Kingdom have spoken, and we respect their decision." He added that the "special relationship" between the U.S. and Britain is "enduring," and that the latter's membership in NATO "remains a vital cornerstone of U.S. foreign, security, and economic policy." On his last visit to Britain in April, President Obama stood beside British Prime Minister David Cameron and came out strongly opposing a so-called “Brexit” vote, saying if Britain voted to leave it would have to get to the "back of the queue" to forge new trade deals with the United States. Obama seemed to appeal to British voters, saying, "The United Kingdom is at its best when it is helping to lead a strong Europe. It leverages UK power to be part of the European Union." In Friday’s statement after the stunning outcome of the vote, Obama highlighted the U.S. relationship with the European Union, saying the EU "has done so much to promote stability, stimulate economic growth, and foster the spread of democratic values and ideals across the continent and beyond.” He said that Britain and EU "will remain indispensable partners of the United States even as they begin negotiating their ongoing relationship to ensure continued stability, security and prosperity for Europe, Great Britain and Northern Ireland, and the world." Obama spoke by phone with Cameron Friday. A White House statement says they are both confident Britain "and the EU will negotiate a productive way forward to ensure financial stability, continued trade and investment, and the mutual prosperity they bring." President Obama also spoke with German Chancellor Angela Merkel. Both said they regretted the decision but respected the will of the British people, and "agreed that the economic and financial teams of the G-7 partners will coordinate closely to ensure all are focused on financial stability and economic growth." Speaking on a visit to Ireland, Vice President Joe Biden said, “We would have preferred a different outcome”, but also said the U.S. respects the will of the people. Republican presidential candidate Donald Trump speaks during a news conference, at his Turnberry golf course, in Turnberry, Scotland, Britain June 24, 2016. In contrast, Donald Trump, the presumptive Republican nominee for U.S. president, welcomed the decision to leave the EU. "People want to take their country back and they want to have independence in a sense. And you see it with Europe, all over Europe," said Trump, who was in Scotland to open a golf course. 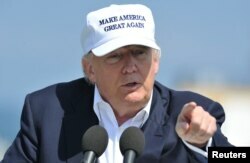 Earlier Friday, Trump likened his candidacy to the referendum vote and said should he win the presidency in November, he would work to strengthen ties between the U.S. and an independent Britain. "Come November, the American people will have the chance to re-declare their independence. Americans will have a chance to vote for trade, immigration and foreign policies that put our citizens first. They will have the chance to reject today’s rule by the global elite, and to embrace real change that delivers a government of, by and for the people," he said in a statement. 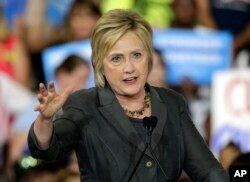 Democratic presidential candidate Hillary Clinton gestures as she speaks during a rally in Raleigh, N.C.
Trump's likely opponent in the presidential race, former U.S. Secretary of State Hillary Clinton, said in a statement, "We respect the choice the people of the United Kingdom have made." The chief task now, she said, is to "make sure that the economic uncertainty created by these events does not hurt working families here in America," while also making clear "America's steadfast commitment to the special relationship with Britain and the transatlantic alliance with Europe." "This time of uncertainty only underscores the need for calm, steady, experienced leadership in the White House to protect Americans' pocketbooks and livelihoods, to support our friends and allies, to stand up to our adversaries, and to defend our interests," Clinton said. "It also underscores the need for us to pull together to solve our challenges as a country, not tear each other down." 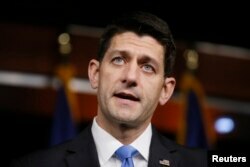 U.S. Speaker of the House Paul Ryan (R-WI) takes questions at a news conference. Can EU Survive a Brexit? Brexit: What Impact for Africa?